VINTAGE HANDMADE GRANDMOTHER'S FLOWER GARDEN COTTON QUILT TOP 90" BY 70"
Vintage Handmade Colorful Grandmother's Flower Garden cotton quilt top that measures approx 92" By 76" shown on a king size bed. The colored part of the flowers is 7" in diameter 10" in diameter to the white edge. There is a small slit on the edge pic 10 with a spot to the right & will need to be laundered. 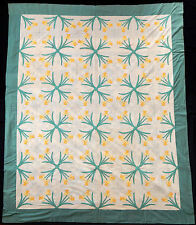 VINTAGE KANSAS SUNFLOWER QUILT GREEN & WHITE STUNNING! 95" X 84"
SIZE: 95" X 84". QUILTS ARE SHOWN ON A QUEEN SIZE BED. FABRIC: COTTON. Sourced from an estate sale - Beautiful diamond blocks likely hand sewn with y-seams. Quilt top appears to be quite old but binding and backing appear to be newer. There is a large crease/bunching in the top/backing, binding is coming unstitched and unfinished - cutter/repair or repurpose. VINTAGE HANDMADE APPLIQUE LARGE ROSE QUILT RED YELLOW & WHITE 52” X 86” TWIN. Condition is Used. Red and green appliquéd rose flowers on white background. These squares are 15 1/2” x 15 3/4” approx. pale yellow between the squares. Backside is a white that is not bright. Quilt should be laundered. I did not due to the bright red flower and unsure how to wash without bleeding. Sold as preowned and used and as is. Please see all photos for best description. Beautiful antique wedding ring feedback? quilt top. All hand stitched and intack. No no loose stitches spots stains apparently. Shown on a king size bed. THIS ITEM: GORGEOUS QUILT. CONDITION: GOOD CONDITION. FABRIC: COTTON. VINTAGE HANDMADE FEED SACK YO-YO QUILT 80" X 88"
FABRIC: COTTON FEED SACK. SIZE: 88" X 80". QUILTS ARE SHOWN ON A QUEEN SIZE BED. CONDITION: NEEDS SEVERAL RESEN TO EACH OTHER. Vintage Americana All Cotton Fabrics LONE STAR Quilt, 102" x 92", Good! ***** preown in good condition, has 3-4 small tear at top cotton fabric only needs resewn (shown in last 4 picture) has 2 small light dirt spot at back, will come off, needs proper cleaning****super cute! *** shipping in U. S. Only**** thanks for looking! QUILTS ARE SHOWN ON A QUEEN SIZE BED. FABRIC: COTTON. CONDITION: GOOD CONDITION SEAMS NEED REPAIRED SPOTS ON BACK. VINTAGE INSPIRED PATCHWORK PLAIDS, CHAMBRAY AND TROPICAL PRINTS QUILT 83" X 85"
THIS ITEM: NICE WELL MADE QUILT. QUILTING TYPE: HAND QUILTED. SIZE: 83" X 85". FABRIC: COTTON. BATTING: COTTON. QUILTS ARE SHOWN ON A QUEEN SIZE BED. FABRIC: COTTON. CONDITION: NEEDS FINISHED. QUILTING TYPE: HAND TIED. SIZE: 60" X 73". QUILTS ARE SHOWN ON A QUEEN SIZE BED. THIS ITEM: NEVER USED. CONDITION: NEVER USED. Handmade Blue Floral Star Block Quilt. This is a beautiful quilt. It has many shades of blue including: violet, navy, light sky blue, and spring green. It has a beautiful pattern on it. As well as a beautiful border. This quilt has no stains on it. It has only been washed 2 times. It is 67” by 104”. It is a very good size. 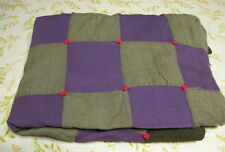 It is a light weight quilt perfect for layering or a single blanket in the spring or summer and sometimes even fall. Don't let it slip away. Just In Case You Get Busy. THIS ITEM: BEAUTIFUL QUILT. SIZE: 79" X 109. QUILTS ARE SHOWN ON A QUEEN SIZE BED. FABRIC: COTTON. 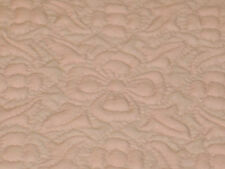 VINTAGE RETRO 1970s QUILTED BLANKET GREAT CONDITION 74" X 80"
THIS ITEM: NICE BLANKET. CIRCA: 1970s. SIZE: 74" X 80". CONDITION: GOOD CONDITION. FABRIC: COTTON. VINTAGE ADORABLE KITTY CAT CHEATER QUILT 99" X 86"
SIZE: 99" X 86". QUILTS ARE SHOWN ON A QUEEN SIZE BED. CIRCA: 1980s. CONDITION: GOOD CONDITION. Sourced from an estate sale. Many blocks have marks as shown in pictures - I have not washed or treated. Note: Due to lighting effects, shadows, & differences in display screens, color in photos may not exactly match color of actual item. VINTAGE QUILT NINE PATCH SQUARES PURPLE FABRIC QUILT BACKING FULL BED 66" x 80"
COTTON QUILT SQUARES, COTTON BATTING QUILT CENTER, PURPLE SATIN RIBBON QUILT EDGING AND PURPLE COLOR FABRIC QUILT BACKING. VINTAGE QUILT APPLIQUE BUTTERFLIES SCALLOPED PINK EDGING FULL BED SIZE 84" x 86"
COTTON BATTING QUILT CENTER AND A STITCHED AND SEWN PINK COLOR FABRIC SCALLOPED QUILT EDGING. Beautiful Dresden plate quilt. Very Pleasant colors. ANTIQUE VINTAGE 30S/40S TOUCHING STAR HEXAGON MILKY WAY FOLK-ART QUILT WOW! ANTIQUE VINTAGE 1930S FABULOUS FOLK-ART HAND-TACKED WOOL 9-PATCH QUILT WOW! 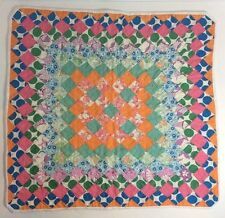 VINTAGE HAND CRAFTED LOG CABIN W APPLIQUE FLOWER CENTERS QUILT 98" X 89"
THIS ITEM: BEAUTIFUL QUILT, BRIGHT COLORS. SIZE: 98" X 89". QUILTING TYPE: HAND QUILTED. QUILTS ARE SHOWN ON A QUEEN SIZE BED. FABRIC: COTTON. CONDITION: GOOD CONDITION THE GREEN HAS BLED THROUGH ON THE BACK. Must be paid for within 48 hrs. all cotton. Condition is Used. All material dates from 50’s and 60’s. Colors are bright and happy. ANTIQUE VINTAGE 30S/40S AROUND THE WORLD FIELD OF DIAMONDS PATCHWORK QUILT WOW! 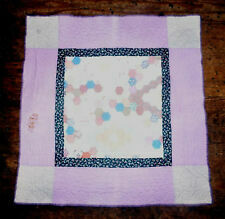 For auction is this FABULOUS hand sewn yoyo or yo yo quilt. It measures 95 x 96 and it is in MINT UNUSED condition- not a thing wrong with it! Features many different colors, but the main color is pink-all the yoyo's are outlined in pink yo yo's.. This is a handmade Queen-size quit top. 95" by 95". My wife makes them as a one of a kind. Crafted from 100% cotton fabrics. Makes the perfect gift to treasure as an heirloom or to curl yourself up in on a cold Winter's night. This is for a beautifully sewn quilt. This quilt appears to be mostly hand sewn. Pictures are of actual quilt on a queen bed. I make every effort the note any imperfections. - Unauthorized Duplication Prohibited. For your consideration; A beautiful country primitive quilt or bedspread, this quilt has lightened with age and has a creamy lightly off white background. It is hand sewn together; measures 52" x 98". This item is estate found and has not been laundered, but it is clean. Very good condition with the occasional tiny age spot and faint age fading. Beautiful and old fashion "back stitching" on this quilt. Payment is due at the end of an auction or a buy-it-now. All sales are final. Items are sold as is. Please ask any questions before end of auction or purchasing an item. Our estimated shipping costs should be correct unless we offer free shipping. We always return gross overages or mistakes on postage. Please note; we want you to have a pleasant buying experience with us!. 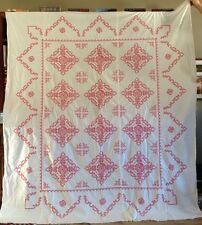 VINTAGE RED & WHITE Xs & Os PATCHWORK QUILT BY NAUTICA 80" X 82"
THIS ITEM: BEAUTIFUL QUILT. SIZE:80" X 82". CONDITION: GOOD CONDITION,,,, FADED SPOTS. QUILTS ARE SHOWN ON A QUEEN SIZE BED. FABRIC: COTTON. LIGHT WEIGHT COTTON BATTING. CUTTER QUILT. MOST OF THE WHITE PARTS OF THE QUILT TOP HAVE WEAR. THIS IS TRULY FOR UPCYCLE IF IT WORKS FOR YOUR PROJECT. I CHECK CAREFULLY FOR FLAWS AND DO MY BEST TO IDENTIFY. THIS ITEM: BEAUTIFUL QUILT. SIZE: 102" X 83". QUILTS ARE SHOWN ON A QUEEN SIZE BED. FABRIC: COTTON. CONDITION: GOOD CONDITION A FEW SPOTS ON THE BACK.